Blackwater’s Erik Prince met with Putin ally on Trump’s behalf, WaPo says. Erik Prince at a House committee hearing on Capitol Hill on Oct. 2, 2007. 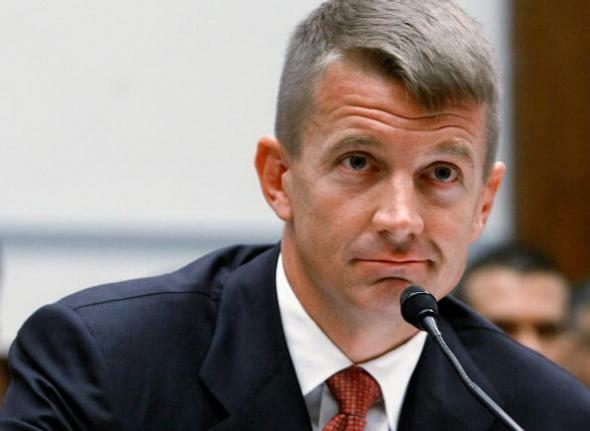 Erik Prince—the founder of the mercenary company Blackwater—met with an ally of Russian leader Vladimir Putin on Donald Trump’s behalf in January, the Washington Post reports. Per the Post’s sources, the meeting took place in the Seychelles—an Indian Ocean island chain—and was brokered by Sheikh Mohamed bin Zayed al-Nahyan, the crown prince of the United Arab Emirates. The Post says the meeting constituted an unsuccessful effort on the part of Team Trump and the UAE to begin to convince Russia to back away diplomatically from Iran, its longtime ally and a UAE nemesis.